How to Move Your Site From WordPress.com to WordPress.org? Your WordPress.com blog is now popular – you probably didn’t even expect this when you first launched it – and you consider moving it to WordPress.org because the latter gives you complete control over everything. While WordPress.com offers limited resources, WordPress.org lets you customize almost anything and personalize the site the way you want. Even if the two platforms don’t seem very different at a first sight, there’s a thick line that stands between them. So can you move your WordPress.com site to WordPress.org in a safe manner? The answer is YES! How? Well, it could take a while until everything is set and done, but in the end you’ll be satisfied by the results. Before you start doing the migration itself, you need to buy a reliable host and a custom domain name. There are lots of WordPress hosting services for any kind of website and you should do a consistent research before you pick one. To make a proper decision, you should know exactly what you want to achieve with your site and what are your needs. Maybe reading about some of the best WordPress hosting providers will help you to understand better how they work and what they offer. If you already have a custom domain name, have patience, we’ll talk about it a bit later. After buying the hosting service, you must install WordPress on it. It will take at most 5 minutes to do the installation. WordPress.org comes with the Famous 5-Minutes Install that presents you the steps to quickly have your WordPress up and running on your new host. So, what do you exactly need to do? Run the WordPress installation script by accessing the URL – the one where you uploaded the WordPress files – in a web browser. It should be something like http://yourdomain.com/. However, there are some hosting providers that install WordPress for you or have their own tools that automatically install WordPress. You can check to see if your host does that. Apart from installing WordPress, you can as well find a theme for your site and do the basic customization – install widgets, plugins, and make all the design adjustments. Finding a theme at this stage of the process is not compulsory, so you can do this at the end after you’ve done the complete migration. To move your WordPress.com site to another platform actually means to move its content. 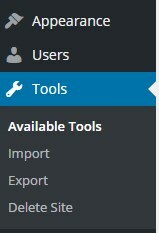 To move the content, you have to sign in to your old site’s admin panel, click on Export button that can be found in the Tools menu, and select All Content to be sure you’re saving all your data. The exported file has an XML extension and contains all the content that you had on your old site, such as pages, posts, comments, images, tags, categories, menus, etc. The file will be saved in your computer and will be used in the next step – the import. 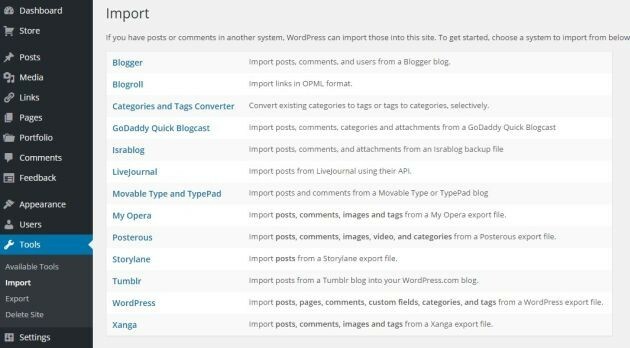 To import the XML file you just saved before, you must go again to Tools ->> Import ->> WordPress. 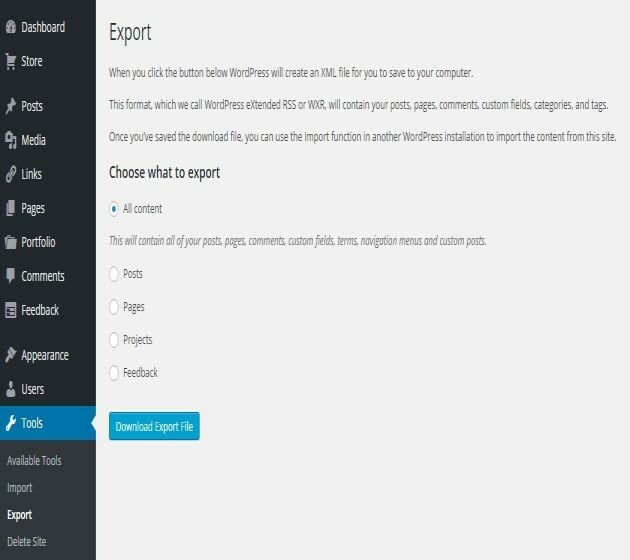 To be able to import the content, you must install and activate WordPress Importer plugin. Actually you just need to follow the steps because the plugin installation is part of the process. Important note! If your file’s size is larger than the limit, you can split it by using the WXR File Splitter tool. Don’t worry about the content, it won’t be affected at all. Just make sure you correctly import all the separate files and everything will work properly. There’s another important thing that you should keep in mind. You’re probably wondering what happens if you already have a custom domain name. If you have it, it must be imported as well. Take your time and follow these steps, it’s not difficult at all. Now that you have a brand new platform, you might want your visitors to come to your new site instead of your old one. By making your WordPress.com site private – or by deleting it – the users won’t see it anymore. Of course, they will see a 404 page, but at least they won’t keep coming to the old URL. The idea is to have them on your new site, isn’t it? It doesn’t help to keep the WordPress.com site active. Go to Settings – >> Reading in your WordPress.com dashboard and select the “I would like my site to be private, visible only to myself and users I choose” option in the Visibility field. Of course, if you still want to keep it visible for certain users, you can choose them and let them have access to your old site. Or there would be another – and more drastic – solution… to just delete the site completely. To do that, click on Tools and then on Delete Site. From now on, your WordPress.com site won’t exist anymore. But be careful before taking this decision because you might still have important data that you didn’t save from the beginning and you might lose it. Check cautiously if everything is in its place before deleting the old site. The five steps above would be the vital steps to successfully move your site from a platform to another. But there are, of course, a handful of other important aspects that you might keep in mind when doing the migration. What happens to your subscribers list? One of them could be the subscribers list. No one wants to lose their subscribers list, even more if they grew a solid one during this time. To keep it intact and transfer it to your new site, use Jetpack plugin. Install and activate it, connect it to your WordPress.com account, and use the subscription migration tool to move all your subscribers. Just follow these easy steps and your email contacts will be safe. 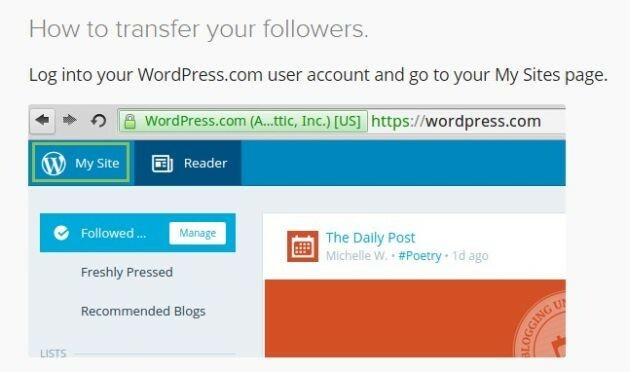 These are the main steps you have to be very careful about when migrating your WordPress.com site to WordPress.org. Do you take any other precautions or use other methods when transferring all your content? Feel free to share them with us! Adelina is a writer and WordPress blogger at CodeinWP and Of living & 'pressing She also creates content for JustFreeThemes. She loves sports, hiking, books, rock music, and she puts down the paper everything she finds challenging and unique. To my mind to start using .org instead of .com in WordPress you should also know how to handle with probable issues and bugs, that you may face. I would like to advice to read about a fixing a bug with image upload after wordpress update. This thing is worth reading. I know, recently a new version on WordPress was announced – 4.4 and will be available soon. So, let’s keep an eye on the latest news. Great post. i’ve used Jetpack! Thank you. So when i post on my wordpress.org blog, my subscribers from .com ill get an email? Hi! Yes, if you kept your all contacts from wp.com, then it will work just the same on wp.org. At least, it should. You can also use the subscribers list if you want to send any announcements or newsletters. 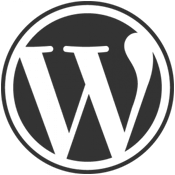 Great post thanks for sharing, WordPress is making it more and more easier to migrate.